But compassion is having a tough time in the age of the internet. We're more connected than ever, but also more distracted. We answer e-mail while talking on the phone, text one friend while having dinner with another. Such multitasking erodes awareness, a key component of compassion. Distraction isn't the worst of it. 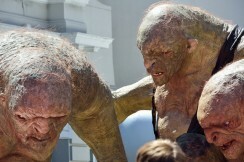 Internet trolls fill the web with flame wars, offensive YouTube comments and bullying. For the most part, trolls aren't psychopaths, just ordinary people who act like jerks online. Psychologist John Suler described the phenomenon in 2007, attributing it to a combination of factors such as physical invisibility and anonymity. The emotional disconnect caused by technological connection is a thorny problem. And if anyone loves to solve problems, it's Silicon Valley engineers. "Technology isn't the end; it's the means to a greater end," says Danae Ringelmann, co-founder of Indiegogo. She described how the crowdfunding platform has been used to give gifts and right wrongs at Wisdom 2.0, an annual Bay Area conference about integrating kindness and mindfulness with business and technology. Future studies could test exactly what it is about compassion that makes people happier, but the mere fact that it does is both encouragement for the future and explanation for the present. Even on the internet, the troll-creating online disinhibition effect is not always toxic—as Suler wrote, people can also "show unusual acts of kindness and generosity, sometimes going out of their way to help others." Ringelmann offered the example of an Indiegogo campaign to give a vacation to a woman who had been bullied at her job. The funding goal was exceeded a hundred times over. Perhaps one day these "internet elves" will outnumber the trolls.